So I got my female 2 weeks ago on a Friday, and took my gliders to the vet the following Tuesday. Everything was fine and they both checked out healthy. So I had been swapping pouches and put their cages next to each other, and haven't heard crabbing. Thursday night I went into the shower with both of them to introduce them and see how they would react to each other. At first my boy (neutered by the way) would hide behind me, but then he would approach her and they got along fine. I put them back into their individual cages, and took them back into the shower last night. They immediately ran to each other and played, and both went to the same pouch in my blouse for a nap. I let them nap for a while in my blouse, checking on them the whole time. They seemed to get along great so I put them in the same cage (a brand new one I just bought, with both their pouches in it). I watched them for an hour and they were perfectly fine. I ran off for an hour to make dinner and came back to check on them. They were fine. I didn't sleep much last night because I kept checking on them and nothing they were happy and fine. 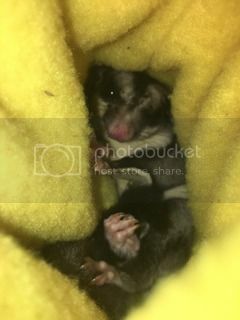 This morning I wake up and check on them, they were happily sleeping in the same pouch so I didn't want to bother them. In the afternoon about 3 I went to grab my boy to put in his bonding pouch (I do this with each of them separately, a few hours each), and my sweet boys fur on his face was missing! It seems Ezra over groomed his head. At first it looked really bad but it was just because his fur was still wet and stuck together. It's hours later now and it's not as bad as I originally thought, but their back in their original cages. I started spraying him with some vetericyn, because I wasn't sure how bad it was in the beginning. But now that his fur has dried I'm a lot calmer lol. So how should I proceed with introducing and eventually combining them? I don't want her to keep overgrooming him because what if it gets really bad for him? But I don't think either should live alone. Am I supposed to get another 2 gliders, or can this be resolved? A little info about Ezra is that I adopted her from a family where she belonged to the teenage daughter. Her cagemate recently passed away but the family didn't know from what. The teenager is a senior in high school and with graduating and college applications didn't have the time for her any longer. She was kept alone in a cage for a little over a month. Her cage was pretty clean looking but it smelled badly, there were no toys (save for a large reptile style branch, and a wheel covered in feces and sticky with urine), and the father said that neither glider ventured in the bottom half of the cage (a double critter nation that had the floors separated with just the entry hole available). As long as there were no bite marks on his face I would leave them together. The one gliders was so happy to have a buddy he or she probably got carried away grooming his new friend. Thanks! I'm very scared to put them together again so soon though. I think I'm going to continue keeping their cages next to each other and scent swapping a little longer. 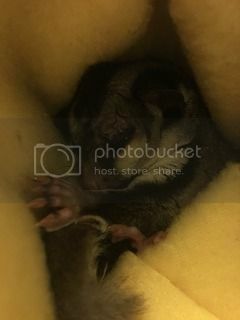 Lately my gliders have been barking at night... both directly across from each other, and my girl is making a weird clicking sound I've never heard before (the closest thing it resembles is that clicking that the alien makes in predator). Every here and there one of them makes a sound like a soda bottle opening (when the gas is being released), but that's in the day and their both in their own cage, in their own pouch. I see them trying to interact all night through the cages. I swapped them cages about 4 days ago too. Anyway I thought it might be a good time to try to reintroduce them. I took them in my shower, and they both were eager to find the other (I took their blankets out of their pouches and gave it to the other to smell). But once they actually happened on each other they balled up and fought! My girl got a bite to the hand (that freaked me out because there was so much blood), but it ended up looking worse than it was. I was able to stop the bleeding with a pinch of cornstarch. And when she cleaned it off I sprayed it with vetericyn. My boy got a bite to the head (which he's still a little bald around the face from her last over grooming). His bite isn't deep, I sprayed him with vetericyn and applied some neosporin to it (which now he's mad at me for). After all this now, I'm seriously thinking that their meant to be better neighbors than friends. I'm coming to the realization that I might not be able to rehome them together again. 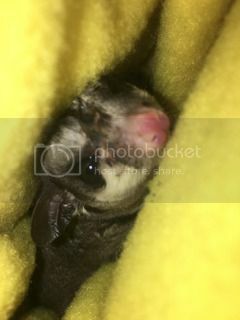 But since I spend so much time with each of them (my boy sleeps in my bra all day with my girl in a bonding pouch, and at minimum an hour each morning in the shower); do I still need to get more gliders as company for them? My fear is now that I might end up with more gliders who don't get along and I'll have cages everywhere (lol which I already do because of other pets too), but I'll be forced out of my home into a bigger one just to have an extra room for my gliders. Which that last one is kinda sorta not an option right now because it would probably literally explode my hubbys head (but we're trying to move in about 2 years when my oldest graduates high school) to another state so we'd like to stay put for the next 2 years. What should I do with my uncooperative little monkeys? Obviously that didn't go well at all, and you don't want to try that again anytime soon. They may need a little more time or they may in fact never be able to peacefully live together. I would continue with swapping pouches/blankets as you have been for a couple more weeks and try one more time. If you have the same result, I don't think I would try again. Like humans, some gliders simply do not get along. I'm really scared to try again, I don't want either to be hurt and the fact that there was blood made me so scared. I have to wait until my boys head heals fully too, because she did overgroomed him before and I don't want her picking at his head. But I am concerned now that maybe her past owners didn't tell me the whole truth. The told me her past cagemate passed away, and they didn't know why. I'm wondering now if she was aggressive and hurt her past friend. There are times where she lunges at me, but I offer her my hand to smell and she calms down. She's very skittish though, like she wants to trust me and then second guesses herself. Whereas my boy was housed with 2 other males (all neutered). I do know that they had her flown in from Texas, and they paid a pretty penny for her because she's a mosaic. But if they can't get along, do I need to get more gliders so they can have someone with them, or they be okay just being neighbors? I never had this problem with my other gliders, they had come to me in a colony so everyone got along.